Hi guys! How are you all doing? Today, I'll be talking about two gorgeous ear cuffs from online shop BodyJewelleryShop. In total, I have seven piercings, I had more before so seven is a few for me. I have my ear, lip, nose, smiley, tongue web pierced. I have an industrial piercing and my right ear stretched to 20mm. When you live in a small town where only one tattoo and piercing studio exists, and they can charge through the nose for body jewellery, you have to explore the online options! When I was 18, I came across BodyJewelleryShop. It has been the best body jewellery shop I've come across. With cheap, but high quality jewellery with a huge array to choose from, especially on ear piercing jewellery and tunnels and plugs. They also offer free delivery when you spend over €10, and prompt delivery, it's fantastic. So I was only delighted when they gave me two gorgeous ear cuffs to share with you guys! They are both so beautiful and I love them alot! Neither of them need pierced ears to wear them. I adored this ear cuff so much! It was something different, yet so elegant and cute. I'm not a big diamond fan in jewellery, but the little diamond completes it and I think it couldn't be without it. This spiderweb cuff is made of high quality surgical steel, so it will be comfortable to wear and won't hurt your ear. Alas, I have inherited my father's tiny, tiny ears, and it is loose on me. I just about hangs on my ear, but I would be afraid of it falling off and losing it. 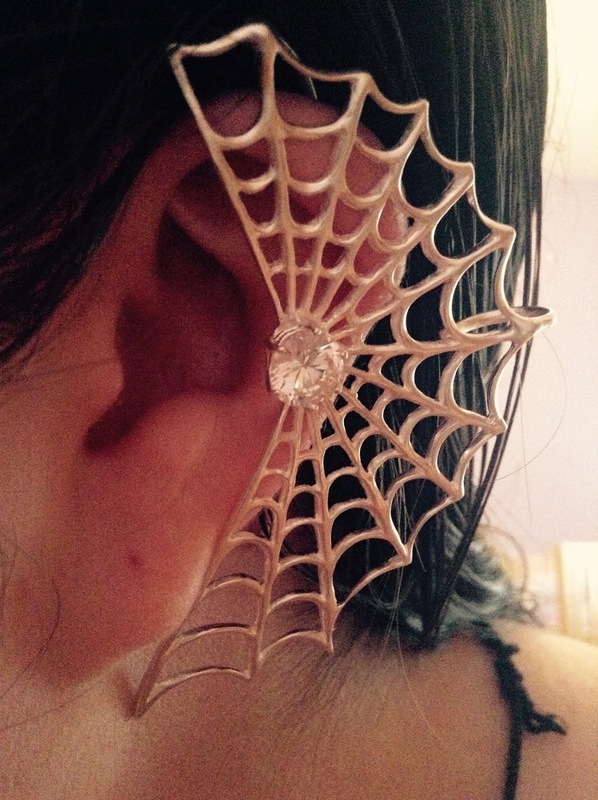 This spiderweb ear cuff costs €9.73. I really really love this ear cuff! Especially the wings. It's definitely something I would go for. 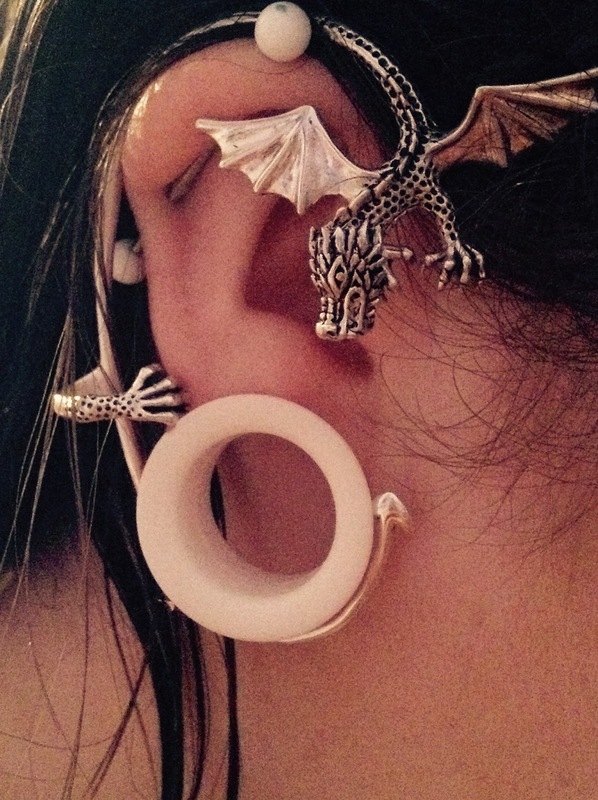 I was worried that like the spiderweb ear cuff, the dragon ear cuff it would be too loose on me. I was only delighted to see that it fitted me perfectly and suited me quite well. 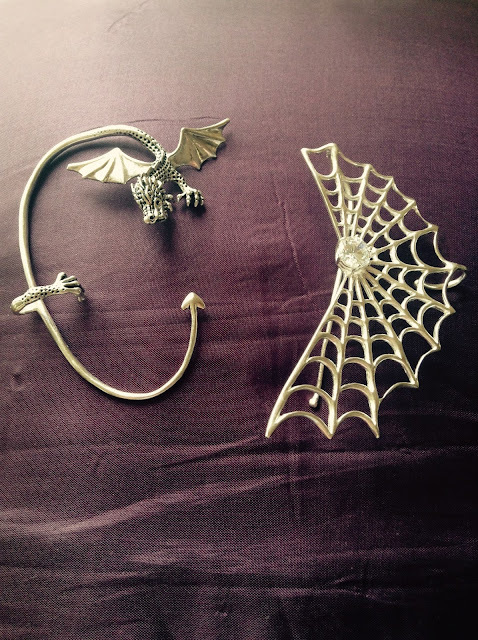 Like the spiderweb cuff, it is also made out of high quality surgical steel. It costs €9.73. Pretty nifty cuffs, huh? What kind of ear cuffs do you prefer out of the two? Let me know below!